The train service has come under some flak recently, with a complete system-wide signal failure the week before we got there, and ongoing criticism of overcrowding on some lines. The Adelaide Sunday Mail launched a “Fix it, Pat” campaign to get some improvements. The train rolled out of Adelaide Station, then sped-up along an express section for a while (including through a station that could have been misnamed after me, Bowden), before stopping at a few more stations to where we got off at Port Adelaide. Ah, Port Adelaide. The suburb of the team that memorably lost in the Grand Final to my team, by a record margin. Wisely, I had decided not to bring along my Cats scarf and hat to crow about it. The suburb itself is full of lovely old buildings, many of them sandstone, dating back from when the area was a thriving (and wealthy, I guess) freight hub. There must still be some of that around, as there seemed to be a lot of trucks zooming along the main roads. A short distance from the station we found the National Railway Museum, a collection of old trains from both the South Australian railways and the Commonwealth Railways aka Australian National. A display of the Tea And Sugar (supply train that used to be the only link to the outside world for many railway towns in the desert between Adelaide and Perth) was quite interesting. But the kids mostly loved the miniature and model trains, and the level crossing bells and lights that could be operated by pressing a button. They filmed this for their young toddler cousin Leo, who is currently obsessed with level crossings (“dingers”, he calls them). After the rail museum we toddled town the street to the Maritime museum. Sadly in comparison this was a little disappointing. Perhaps because of its location in a building rather than on the water, it only had one boat to look at, which was not in the water, and although the displays were quite interesting (I got to see a replica boat cabin along the lines of what I expect my mum sailed aboard from England to Australia in early 1970), the kids would have liked to have seen more actual boats. The display of fairground clowns did catch their interest, though I fail to see the relevance, myself. I found the dolphin head in a tank a tad disturbing. But Part II of the maritime museum was more interesting: the ticket included a climb up the nearby lighthouse. It was a steep climb, cramped in places, but a terrific view from the top, of both the nearby streets and the water. Once down again, we tried to sing some of The Goodies “Jollyrock Lighthouse” song on-camera, but couldn’t remember many of the words. We ate lunch at a nearby pub, the fish’n’chips’n’salad going down a treat. The nearby Aviation museum was kinda on the plan, but the kids didn’t seem that keen, so we gave it a miss. Instead we headed back to the train (noting only afterwards there’s also a military museum in the vicinity) and headed back into central Adelaide. There we changed onto the (newly extended) tram to Glenelg. Boarding at the second stop, we got seats, but there were a lot of people on the tram, with some standees all the way to Glenelg. The trip was very slow in the CBD section, and it became apparent that Adelaide’s traffic engineers had given it zero priority over other traffic. Okay, so Melbourne’s trams don’t do so well in this department either, but at least in many locations T (tram) light phases are inserted into the sequence when a tram is present. Not so in Adelaide. In contrast, beyond the CBD, the tram gets onto its own reserved track, it speeds up and has railway-style boom gates to keep the cars out of the way. The tram had a conductor, but he seemed to fulfil the role of a human ticket machine. Not actually checking tickets, only selling them, he walked up and down the tram asking “Anybody need any tickets?” Presumably inspectors do check them from time to time, but I didn’t see any on our travels. Before too long we reached Glenelg, a kind of Adelaide equivalent St Kilda Beach: lots of shops, cafes and tourists. We peeked in the window at the Rodney Fox Shark Experience, but I was a tad disappointed to see it didn’t include an aquarium. I’m not sure where I got the idea that it did, but instead we decided to get some ice creams and enjoy the beach for a while. Jeremy did a big smiley face in the sand, Isaac did similar, and I just sat in the sunshine watching the planes take off from the nearby airport, blissfully unaware that my bum was becoming just a teensy bit damp. A sticker on a Fish Measuring Station sign encouraged those with rods to go and read Chomsky instead. Or perhaps while you wait for a bite. I wonder how many follow this advice. Eventually we headed back for the tram, but not before looking at a few of the shops. I wanted to get some stamps and postcards, and also a copy of The Age to check out an article I’d been rung up about the previous day. Unlike trying to buy the Adelaide Advertiser in Melbourne, you can get The Age at virtually any Adelaide newsagent. And we continued snapping our pictures of Adelaide food purveyors with rhyming names: around the place we’d found Wok in a Box, Snag in a Bag, and Fasta Pasta. Though we didn’t find one Isaac later made up, Curry in a Hurry. Back on the tram to the hotel, a short rest then out for dinner. This time: Mexican at a place in Hindley Street. Unfortunately it wasn’t called Mucho Nachos or Neato Meato Burrito, but had the still-amusing name of Burp, and was very tasty. And back in the hotel room in time for Mythbusters. 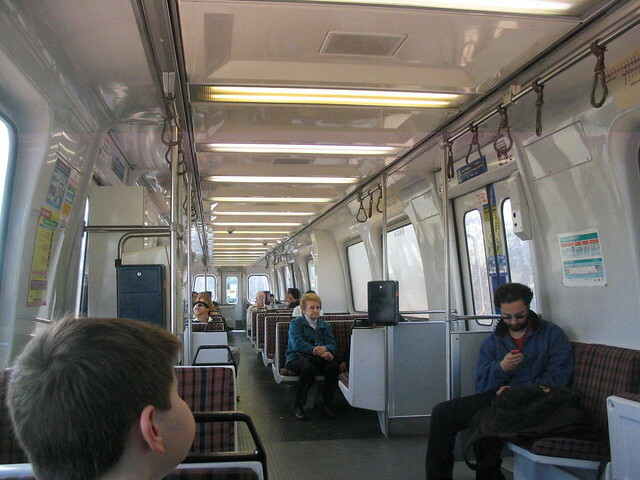 >> The seats and walls were very clean compared to MelbourneÃ¢â‚¬â„¢s trains, though some of the windows were a little difficult to see out of. What is exactly wrong with the train windows? They look to be more than just dirty. Adelaide has a tiny rail network, but it could and should be expanded. There is a notable chunk of suburbia unserviced by any rail in the north-east suburbs. Andrew, see the link Chris posted there. That’s quite representative. I’m not sure what the cause is exactly, but some of them are kind of foggy. Others are scratched up a bit, but relatively easy to see out of. adelaide girl here. outer harbor has no u in it for the same reason that victor harbor has no u in it. i think there was some surveyor general back when adelaide was settled who basically mis-spelt harbor everywhere and that is how it has stayed! It was originally thought those Poxboxes had plastic windows for safety reasons, whereas our awesome Jumbos have glass and hence do not have this problem. However, it has since been determined the windows ARE in fact glass but have some kind of film on both the inside and outside. Hence we have two problems – 1. Brats scratching tags into them, 2. The window cleaning process causes some kind of reaction with the film. 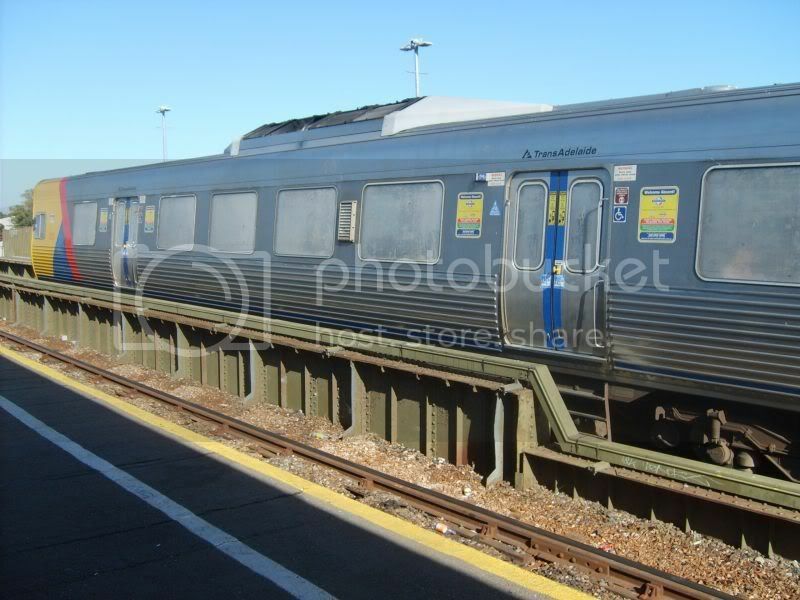 Hence Adelaide has an entire fleet of trains with windows that cannot be looked through – and it’s been this way for years. Thanks for the explanation Chris. In Melbourne we cover our tram windows with advertising. Same result, you cannot see out, but at least we earn money from it. In the USA we spell “harbor” this way. We spell it “harbour” to make a place such as a mall, town, or housing development seem upscale, exclusive, snooty, and sophisticated. I had fun visiting Adelaide but didn’t get to see as much as you did. Today the gray column to the right of the page is covering the last few words of some of the writing in the story. I had to guess what the covered words were. Jed, thanks for reporting the display problem. Appears to be an issue in IE6. Until I figure it out, the workaround is to select all the text (Ctrl-A) and copy it into Notepad or similar to read it… or upgrade to IE7 or Firefox. Daniel – seems like you *did* have a lot of fun in and around Adelaide, in spite of the tourist info being a bit “thin on the ground”. And, while the rail network *is* small, I was blown away when I moved here from Sydney to find that, of the 85 railway stations in the system, 84 [*84* !!!!] are wheelchair accessible, and the only one that isn’t has a Heritage Order on it and nobody has yet been able [or bothered] to design “access modifications” that won’t be contrary to that Order. You trained on by me! If I had known, I would have waved! I am in Bowden and get to hear the trains regularly. Just far enough from the line for a romantic background noise, not a full on, “oh my gods, the world is ending” shake and rattle. Noel, Melbourne has around 200 stations. All but one are ramp accessible. (Some are not strictly DDA-compliant though, eg ramps are there, and wheelchair users make use of them, but they don’t have the legally required gradients etc). Interesting to see the new trams running to Glenelg. It was the old stuff only of course in 2001. Did you see any of the historic trams running between the new ones? We were told that that was very much “the plan”. Glenelg is a lovely place, isn’t it? One of my nicest memories. Did you see the amazing triple-gauge set of points in the railway museum? Oh and I caused much amusement there by asking whether the Federal or territory government ran the suburban rail system in Darwin……. Fianlly, Isaac deserves at the very least the Booker Prize for coming up with “Curry in a Hurry”; I must sell that idea to one of our Balti restaurants here! Truly inspired and Isaac you have a great career ahead of you in advertising! According to the info I have, the old trams only run a handful of trips on weekends. And of course Glenelg is the only palindromic destination that you can get to on an Australian tram.